It takes time to have an engaging social media audience and you will probably have to wait for some time if you want that to happen to your brand on social media. After all, it is not an overnight task. Targeting the right audience and converting them into customers is the prime purpose of social media campaigns, but finding the right social media audience is the most important task here. Most of the times it happens that promoting a particular brand in the world of social media often feels like you are just shouting in a world where no one listens to you. I mean, how many times has it happened that you posted many photos and videos and seen no results at all? Well, that is how things work in the world of social media. That is why it is important to be clear that Social media audience is something that you will not get easily. But, if you need some help on how to do it, then we have some helpful tips for you. With the help of these tips and strategies, you will be able to grow your audience on social media in a quick and easy way. Here are some of the tips that will help you in getting the perfect audience that you want. One of the most important things that you might have to do in here is to know the audience that you have. Well, if you have to have an audience that is both engaging and attentive, then you need to know who you are dealing with. Learn all about the requirements, the likes, and dislikes of the audience that you will be reaching out to. It is a very important step and you cannot possibly forget about it if you want a proper audience for your social media site. There are some important questions that you might need to ask before you know the audience. Does your audience respond well to the images and links that you send? Do they always remain active on the platforms that you post? Do they have multiple accounts for different platforms? These are some of the most important things that you need to know. Also, you can have some forms for the people so that they can tell you about their preferences. That is another great way of knowing your social media audience. This is something that you most probably know about but it is a very important part of the process to get an engaging audience in social media. So, we are going to have a little talk about it. When it comes to growing an audience on social media or getting some followers in the first place, you need to make sure that you have a plan in your mind. Don’t be alarmed, people. It is not really as difficult as you think if you have the right guidance to help you out. One of the most important things to get the desired audience is a social media strategy. You need to use all the insights and information that you have about the audience to create the perfect plan that will boost the growth of the brand. Are you a little bit confused? Well, all you need to do in here is to find out how many times do you have to make a post or what is the perfect time to make the posts on social media or what type of content would your readers like to read. Make sure that you ask yourselves these questions as they are certainly very important for the growth of the social media audience. Use these particular pieces of information and align the objectives of the brand and you will have a brand new and effective strategy for yourselves. Now doesn’t that sound appealing? Well, you should try it for sure and see the results. Aren’t you just tired of seeing the videos and photos that talk only about the product in a sales-y manner? Well, this is the case with all the other visitors out there. No one really wants to look at a post until and unless it has some sort of value hidden in it. So, this is the third tip of the day that we have for you. Promoting your brand and products on your post is another thing and using things that are brought and add no value is something else altogether. You need to make sure that you are adding some sort of value into the lives of the people and also promoting your product. This way, you will be able to inspire them and then make them think about the product that you want to promote as well. Let us give you an example to help you out. Suppose you are thinking of posting a particular photo that will highlight and promote the brand that you have. So, all you need to do here is provide some information about the product and how the users can use it in order to make their lives a bit simpler. Providing valuable information is one of the most important things that you need to take care of. There is no value for content that doesn’t have any form of authenticity in it. One of the most important things that you need to keep in mind is that if you want to be better than the others that have a similar business as you do, you need to have some originality in your content. Otherwise, the people will not notice the difference between you and your competitor’s posts. That is a risk that you shouldn’t be willing to take. We all know that having originality in the content is something that will provide your brand with the much-needed recognition and it will help your brand get more and more audience as well. So, this is another one of the most important tips that you need to keep in mind if you want to have a social media audience that is attentive and engaging. When it comes to finding a perfect social media audience for you, you need to have some additional help for your posts. This is where the social media influencers will come into action. These influencers are the people who will promote your posts on social media and help you get the desired audience that you want. However, you need to make sure that you choose someone who is worthy enough. Don’t just go with the follower count when you are choosing a particular influencer for social media. Ensure that you choose the one that will be fit for the brand. That will definitely be an investment that you do not regret. Make sure that you do proper research when you are looking out for one. If you do that then you will see the best results immediately. Try to engage commenters as quickly as possible. So, that is all that we have for you in here today. 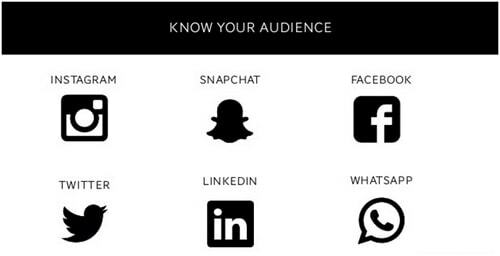 If you want to have the best social media audience for your brand, then these are the tips that you should follow. You will not be disappointed for sure. In case of any doubts, feel free to ask us in comments below.